IN the August 2005 issue of The Railway Magazine Nick Pigott described the railways of Peru and some of the incredible infrastructure in use high in the Andes mountains. Nick rode on a freight train on the highest railway in the world – the Andean Central – which today has occasional passenger trains, but is now only the world’s second highest line after Chinese Railways opened the Qinghai to Tibet railway line to Lhasa in Tibet in 2006. A decade later Keith Fender looks at how Peru’s railways have developed since then, and finds the story is unusually positive for a South American nation with growing freight traffic and more passenger services – including open access ones! The Trans-Andean is still run by Ferrocarril Central Andino (FCCA), with its 30-year concession having now been extended by 10 years, meaning it runs until 2040. Freight traffic on the line was under a million tonnes when the concession started – 900,000 tonnes in 2001 – and this has now grown to 2.5m tonnes in 2014 with 4m tonnes forecast by 2018. FCCA operates between 50 and 70 freight trains a day (2,100-2,200 each month), although not all of these operate the full length of the line. Peru has a booming mining industry, with significant investment by international mining firms, including several from China, and the production of copper, lead and zinc, all found in substantial quantities in some parts of the Andes, means traffic is likely to grow further on the FCCA and other Peruvian railways. FCCA passenger train high in the Andes (at 4,000m above sea level) on October 8, 2015 with C39-8 No. 1028, hauling the train through the volcanic landscape. A huge new mine has been opened by Chinese mining firm Minera Chinalco Perú, near the line’s summit at around 15,000ft (4,750m) above sea level. The new Toromocho mine is served by spurs from the main route and has a small internal system with loading facilities. New wagons were bought from US company Trinity Rail to cope with the additional traffic from the new mine; the company also supplied 220 bogie ore concentrate wagons and 90 modern tank wagons for the sulphuric acid traffic carried at the lines’ western end. FCCA now operates around 700 wagons, mostly bogie designs, some of which are owned by customers. FCCA has improved both infrastructure and the safety of operations. One of the investors behind FCCA is US-based Railroad Development Corporation, and the North American influence is clear in terms of extensive work to renew and upgrade the line using much heavier rail – 115lb (52kg) rail replacing older 70lb (32kg) or 80lb (36kg) rail. Axle loads have increased following the track upgrade from 20 to 32 tonnes – crucial on a railway where the six zig-zag switchbacks limit the length of freight trains to 17 bogie wagons. The rail for the upgrade has been imported via Lima’s port of Callao from the USA as there is no domestic or local supplier on the western side of South America. The 30-year concession contract with the Peruvian Government has been extended twice (both times by five years), and rather than take concession payments the Government is choosing to re-invest the money, with FCCA working to upgrade the line to a higher standard than either the Government or FCCA imagined possible in 2001. FCCA hopes that continued traffic growth will enable further investment and has previously proposed a 23.2km base tunnel high in the Andes to replace three zig-zags and the current summit tunnel. Other options, such as spiral tunnels to replace the zig-zags, are also under consideration although construction currently seems unlikely anytime in the next decade. Operations in the early years of the concession were regularly disrupted by derailments, sometimes writing off locomotives. The mixture of investment in track, plus an approach to health and safety that wouldn’t be out of place in Western Europe or the USA means that derailments are now very rare, as are accidents leading to serious injury. FCCA inherited a mixed fleet of older Alco- and EMD-built locos from former state operator ENAFER when it took over the concession. In 15 years of operating the line FCCA has found that GE locos, with their four-stroke engines, cope better at extreme altitudes, where the thinner air and lack of oxygen cause difficulty for all internal combustion engines. FCCA has found that turbochargers often run overspeed at altitude as the air is thinner and the engines performs less efficiently due to the lack of oxygen. 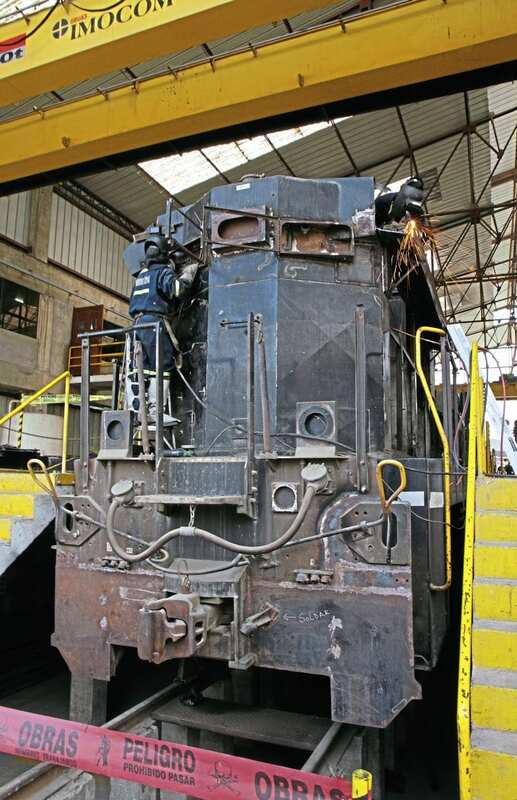 The two-stroke engine designs in the older EMD-built locos inherited from ENAFER have been found to be less effective – especially on the highest trans-Andean section of the line. FCCA has been able to change its fleet as the terms of the concession mean that any assets no longer needed can be returned to the Peruvian Government. Most of the 28-strong FCCA loco fleet are GE models, rebuilt for use in Peru after service elsewhere. FCCA is currently completing the conversion of 15 GE C39-8 Co-Co locos bought second hand from US freight railroad Norfolk Southern for use on its network. The conversion work is being undertaken at the main FCCA depot in Chosica, about 50km east from Lima, where the locos are overhauled and the loading gauge reduced to enable them to fit through the narrow tunnels on the high mountain section of the line; FCCA describes the locos as ‘Andean profile’. The 3,900hp GE engines are overhauled in the USA before being shipped to Peru for fitting in the locos. Six more ex-NS C39-8 locos have been bought and may be converted in the future. An earlier batch of eight second-hand GE C30-7 3,000hp locos (originally used in Mexico and USA, and also in Venezuela, by private operator Corporacion Venereil), plus two 3,900hp B39 units from US Class 1 BNSF were rebuilt in the USA from 2001 onwards. 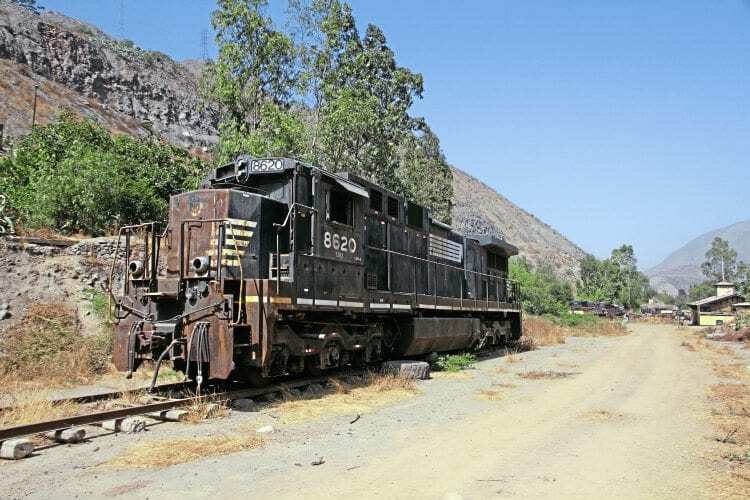 The C30-7 and B39 locos are now considered underpowered for the high mountain section and steep grades. Experiments with compressed natural gas as a supplementary fuel for the C30-7 locos undertaken a decade ago have not been rolled out more widely, and diesel is used as the only fuel source. The trials did increase power output at altitude, or more accurately enabled it to remain constant at around 3,000hp, otherwise it would drop by around 10%. GE C39 No. 1027, near Chosica, with a train of minerals bound for the port of Callao. FCCA do still use a handful of EMD-built locos, but only at lower altitudes, and have bought three second-hand SD40 locos in recent years, formerly used in the Chicago area. These are used on the 102km section between Callao (at sea level) and Matucana (2388m above sea level), where track upgrades are complete, allowing 32-tonne axle loads for freight trains on this section where train lengths are not dictated by zig-zags (which are all beyond Matucana). In the 2005 feature the lack of passenger services was mentioned. However, in the intervening decade they have returned, initially only a few times a year, but from 2016 up to 12 departures are planned between Lima and Huancayo; the main city in the 3,300m-high Mantaro valley. FCCA has even bought some second-hand DMUs from Denmark – four Lynette-design two car sets, built in Germany at the Duewag (now Siemens) plant in Krefeld from 1965 onwards. Plans to use these in the relatively highly populated Mantaro valley between Huancayo at the end of the line and Jauja to the north (partly utilising a little-used short branch line to Jauja itself) have so far come to nothing as the investment necessary for fencing and level crossings has not been provided, despite being promised by the regions’ politicians. Chinese mining company Minera Chinalco Perú also bought four similar DMUs from Danish operator Østbanen, and with FCCA’s assistance one was specially modified for use at altitude. Planned regular operation of the trains for mine workers at the new Toromocho mine has not so far progressed further. A small number of coaches built in the early 1950s in Sheffield by Cravens for FCCA’s private predecessor, which was owned by a London-based company, remain in use for works trains. However, they are no longer used for passenger trains, having been replaced by more recent (but similar-looking) coaches built in Romania. Peru’s railways were only run by Government company Empresa Nacional de Ferrocarriles del Perú (ENAFER) for 27 years, from 1972. FCCA has returned unwanted coaches to the Government in the same way they have disposed of locos they no longer want. Its not known what the Government has done with the coaches although it seems likely they will be scrapped once FCCA no longer needs them. 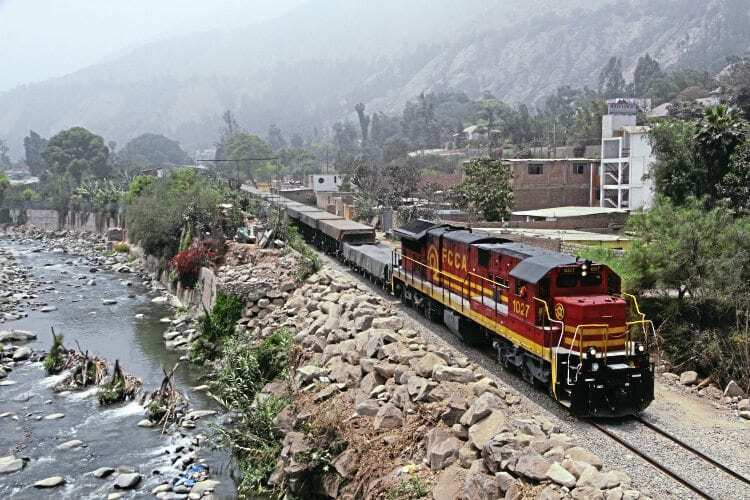 The other line in Huancayo – used by the ‘El Macho’ train to Huancavelica – has been converted to standard gauge. FCCA undertook the work as contractor to the Peruvian Government, which is now trying to find a private concession operator for the line to replace the current regional Government-owned one. Ex-Norfolk Southern No. 8209, stored at San Bartolomé for future conversion. 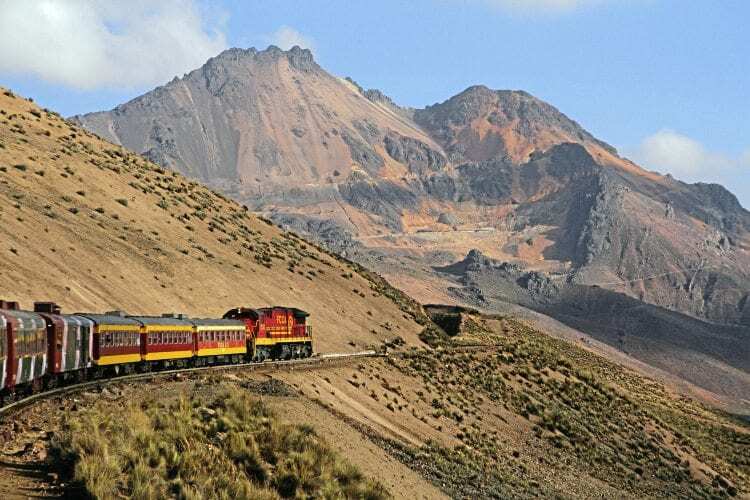 By converting the line to 1,435mm gauge the Government hopes mining projects near the route will be able to expand using the line, and then the Trans-Andean route to export minerals from the Pacific port of Callao in Lima. Part of the track used for the re-gauging came from the abandoned 80km line to Chaucha that used to leave the FCCA main route south of La Oroya at Pachacayo. The re-gauging work was completed in late 2010. ■ In February’s edition of The RM Keith concludes his Peru odyssey by taking a look at Lima’s metro network and the line to Machu Pichu.